When we bought this home three years ago, we noticed the cactus-y plants at the end of the driveway, just beyond a beautiful hedge of pink and white oleanders. The cactus-y plants remind me of giant octopuses, and they're not my favorite plants. Last spring, Milton was working in the yard and came running inside. "Come see what's happening to one of those plants by the driveway!" 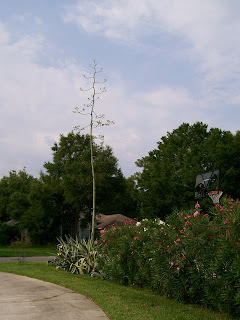 I ran outside and saw a tall skinny pole-like thing growing out of the middle of one of the cactus-y plants. It was about six feet tall. "What in the world?" I said. "Isn't that weird looking?" he said. "It wasn't there yesterday. It grew overnight." 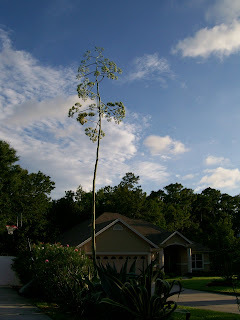 Amazingly, the next day, it was taller, and the next day, taller still. Every day it grew a few more feet, reminding us of the story of Jack and the Beanstalk. 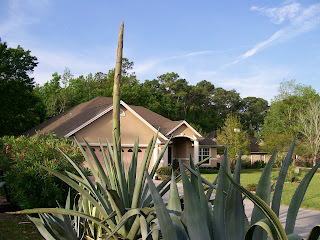 One day, one of the neighbors exclaimed, "That's a century plant, and it's fixing to bloom! They bloom once in their lifetime, usually when the plant is anywhere from 15 to 25 years old!" The pole thing kept growing until it was past telephone pole height. We googled "Century Plant" and learned that it would bloom with yellow blooms sometime in the summer, is found predominantly in New Mexico and Arizona, and is what tequilla is made from. We kept watching, and sure enough, the top sprouted yellow blooms. Nice. Unique. A fun thing to watch and talk about all those months. A fitting correlation to many things in life...it takes time to achieve the best in something...like in marriage...or in your career...or in a relationship, etc. But...Google also said the plant dies after it blooms. Further research said the plant would rot and stink if it wasn't taken down quickly enough. So a couple of weeks ago, Milton puts on a sweatshirt to protect his arms from the awful thorns on the plant and goes out to cut it down. He works and works and works, sweating like all get out as he cuts off the "arms." But he realizes the stump and root will need to be removed with a chain saw and more manpower. He calls a deacon in our church (we pastor a church) and asks if he has an hour or so to help him in the next couple of weeks, and shortly, that heart-of-gold deacon is standing in our yard sawing down the stump, with Milton stacking it neatly by the curb in the correct lengths for pickup on yard trash day. In short order, they pull the massive root out of the ground via a rope tied to Deacon's pickup truck, and the project is completed. The lesson here? I'm always looking for lessons in things, I guess because I was raised this way, with my mother always saying, "Well, next time, do this (whatever), and it'll turn out better." In other words, What can I learn from this experience to make it better the next time I do it? A good way to look at things. The lesson? Teamwork, I suppose. And that can be applied to many things in life. But...Deacon's wife calls Monday morning and asks if Milton's legs are "eat up?" Deacon's legs are covered in an angry red rash, she tells me, and I report that no, Milton doesn't have a rash. She says she researched and found that the Century Plant is toxic. Apparently, the sawdust hit Deacon's legs (he was wearing shorts) as he sawed the trunk down. Wednesday night at church, Deacon pulls up his pants leg, and I about faint. It looks like ten thousand ants have bitten him. Oh, my. I felt terrible for him. I'm not sure what lesson I see in this, unless it's to know all the facts before doing something, and to research thoroughly and get advice before doing something new-to-you. Thank God for heart-of-gold deacons and church people. You can depend on them. "Let me know when your other Century Plants need taken down," he recently said. Kristy: Eva, tell us a little about yourself and your latest novel. Eva: In two months I’ll celebrate a half century of life! I’m very excited about that…I’ve invited 50 of my friends and family to celebrate with me. I am a writer and speaker by profession, a wife, mother, and grandmother by the grace of God. I am a seminary graduate and could read and study the Scriptures all day if time would permit. I love the beach in summer, the mountains in winter. I get very passionate about Israel, the land and its people. 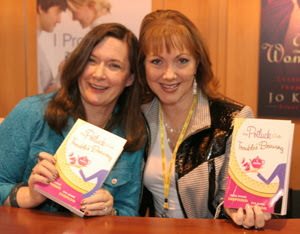 My latest novel is written with my buddy Linda Evans Shepherd. It’s the third in the Potluck Club series, titled The Potluck Club Takes the Cake. The novel continues the saga/story of our six ladies from Summit View, Colorado…their friendship, their ups and downs, their faith struggles, and always…ALWAYS…lots of fun and recipes! Kristy: What's your web address? Kristy: What is your husband's name? Kristy: How long have you been married? Kristy: Since you have a marriage of longevity, you must be doing something right. Do you have any words of advice to offer? Insight? Encouragement? Eva: When our oldest daughter was engaged to be married, she and her soon-to-be hubby had a fairly serious "disagreement" over an issue that just wasn't that important. It was sheer miscommunication. Nothing more. Nothing less. I said to her, "Sweetheart, I will not interfere in your relationship with Jimmy. But please allow me to say this: pick the hills you want to die on. If the hill isn't worthy of blood, don't die there." That's the best advice I can give in the natural. The "beyond the natural" is this: if Christ is the center of your household, He will hold all things together. Kristy: How did you meet him? Kristy: Was it love at first sight, or did love come softly? Eva: Softly. If you had told me when I first met him that I’d be his wife one day, I would have laughed my head off. Nice guy, but…I wasn’t interested in anything more than him as a friend. Kristy: How long did you date before marriage? Eva: May of one year to February of the next. Kristy: How long did you date before you kissed? Eva: (Laughing out loud.) Ummm….like within ten minutes in the first date!!! Eva: I was home from work because I’d had a little outpatient surgery. He called and asked if something was wrong and I told him. He asked if he could come by…bring me anything…. I told him I wouldn’t mind a McDonald’s cheeseburger, fries, and a Coke. So, he brought it by. This is the story that constitutes our first date!! He tells me now that he’d had a spark for me for some time before that. He’s very shy so it really shocked me when he sat next to me on the sofa and, between my bites of cheeseburger, leaned over and gave me a quick kiss. Kristy: Ahhh, how romantic! Tell us about the time/occasion you told him you loved him. Eva: I don’t remember my telling him, but I definitely remember his telling me! He was chasing me in my mother’s back yard. When he finally “caught me” I laughed out loud (ah, what a precious and fun moment! ), and he swung me around and around and said, “I love you, you know that?” I remember it felt that time stood still. Kristy: Ahhh, even more romantic! Tell us about the proposal. Eva: I proposed. Six times before he finally said yes! Actually he didn’t say yes. I’d made it clear that I wanted to marry; he’d made it clear that he didn’t. We happened to be at the mall one evening, and we walked into a jewelry store. He walked over to the wedding rings, and I came up behind him. I asked him what he was looking at. He said, “Wedding rings.” I asked him why. He said, “If we’re going to get married, we’ll need rings.” I said, “Is that my proposal?” And he answered, “Best one you’re going to get!” And that was that! Years later we took our grown daughter into the store and reenacted the moment for her and the sales staff. It was pretty special. Kristy: Tell us about your wedding. Eva: We eloped! And I was two hours late!! I had stopped to talk to a friend and lost track of the time. Isn’t that awful!? 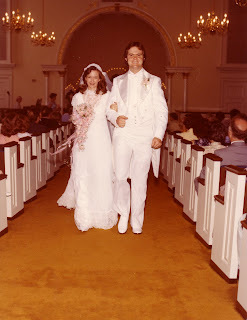 But we married in the living room of my pastor and his wife with our best friend Ray and Joyce Scoggins as witnesses. Kristy: Did you buy, borrow, or make your wedding gown? Eva: It was just something I pulled out of my closet. Kristy: Did he smash the cake in your mouth, or was he a gentleman and gently put it in? Eva: We had cookies and punch, furnished by the pastor and his wife. Kristy: Where did you honeymoon? Kristy: Eva, what a delightful love story. Thanks so much for sharing! 1. What's the one book or writing project you haven't yet written but still hope to? I'm in the process of writing a novel about grace, and it takes my breath away as I write. I hope and pray the Lord allows it to be published. It's one of those books about which authors say, "God gave it to me." Well, to be honest, I feel that way but won't say it, because I don't want to sound naive or braggadocious. You can go both spectrums with that statement, professional authors know. But I will say I feel an anointing as I write. 2. If you had one entire day in which to do nothing but read, what book would you start with? The Bible's a given, so I'll say what I'm into right now. I'm reading Anne of Green Gables; pulled it off my bookshelf last Sunday evening after my husband and I watched four segments on PBS (for the umpteenth time; love them!). Wonderful novel. I'm also re-reading some fiction craft books (I'll try to improve my craft until my toes turn up!). One is Donald Maas's Writing the Breakout Novel. 3. What was your first writing "instrument" (besides pen and paper)? An electric typewriter and after that, an Apple IIc. 4. What's your best guess as to how many books you read in a month? The stack is high beside my bed, and once I read them or throw them against the wall (just kidding; a writer's frustrated moment), I change them out from books in my study. The number? A good 15-20 I go through. 5. What's your favorite writing "machine" you've ever owned? My PC. I'm low tech but it works. 6. Think historical fiction: what's your favorite time period in which to read? I love the early 1900s era (think Christy and Anne of Green Gables) and I like the 1800s (think Jane Eyre and Victoria Holt's novels). This is an off-the-top-of-my-head answer; I love historicals from all eras. 7. What's the one book you remember most clearly from your youth (childhood or teens)? There are too many to list. But I'll try to narrow them down. Pippi Longstockings. Nina Grant nurse books. Jane Eyre. Christy. Hidden Pearls (teaches purity to young girls). Sorry. You said one. Oh, and the Bible. My mother had me memorizing it when I was two years old. "For God so loved the world that He gave His only begotten son..."
Kristy: I'm delighted to interview Linda Evans Shepherd today and find out "The Linda Evans Shepherd Love Story." 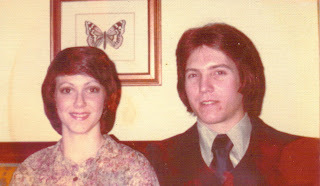 Above are photos of Linda and Paul at their wedding, and then recently. Linda, tell us a little about yourself and about your latest novel. 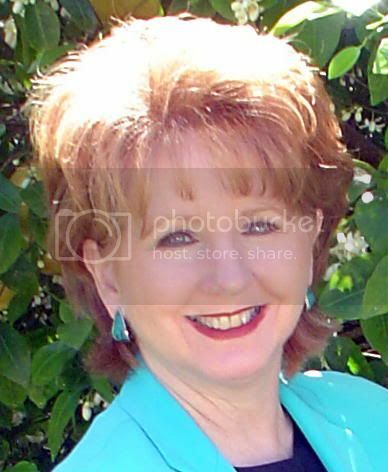 Linda: I’m a busy author and speaker, the president of Right to the Heart Ministries, founder of Advanced Writers and Speakers Association, a TV host, and a host of a syndicated radio show. My novel Potluck Club was an idea that came to me as I was driving through the mountains of Colorado with my family. It was an idea so vivid that I picked up my cell phone and called my friend Eva. After several dropped calls, I was finally able to relay the concept. Eva said, “Let’s do it!" So that’s how the prayer and potluck club of Summit View was born. Eva and I had a blast creating the six characters, three of which are mine and three of which are Eva’s. We take turns writing and reacting to the plots and situations that arise. Linda: A successful, happy marriage is never an accident. It happens when two people decide to love each, regardless of life's circumstances. Paul and I have had our share of difficulties, especially when our dear baby daughter was injured in a car. Delightful Laura survived her injuries but lives a life of extreme disability. 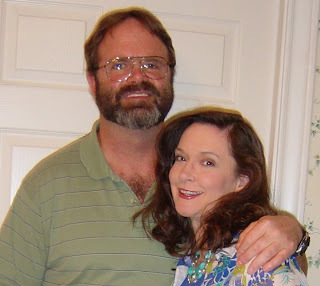 Paul and I love her despite her special needs and we love each other despite our own shortcomings. Paul and I do not view our life together as tragic, but as an adventure where God and love overcome everything. We've pushed past our former pain to find real joy as well as marital bliss. Kristy: Great answer, Linda! Now, back to your love story. If you were a Christian before you met him, were you praying for a husband (as opposed to just trusting God with your entire future)? Linda: Paul and I were great friends for years. I wouldn’t go out with him because he wasn’t a believer. This came as a great shock to Paul who’d never been turned down for a date before. After my rebuff, we spent hours on the phone together, discussing matters of love and faith. Paul ended up at a large Christian gathering in San Antonio with his friends from McNeese State. I, too, was attending this same event with my friends from Lamar University. Though there were 28,000 students there, and neither knew the other had plans to be in San Antonio, Paul and I ran into each other everywhere. In fact, it was then, while 40 of my college friends and I were praying for Paul, that he came to Christ. Linda: I didn’t see him again until we were 17, when I was out cruising the streets with one of my girlfriends. Ellen knew Paul and we stopped in to see him at his job at a tennis store. I didn’t recognize him at the time, but I did notice he was cute. We didn’t date then, but became great friends. I told all my girlfriends if Paul were ever to become a believer we’d end up married. When Paul did come to faith, then transferred back to Lamar, I knew it was just a matter of time before we marched down the aisle together. The poor guy never had a chance. Linda: BLUSH! Our first date. It was just that we saw the movie, Heaven Can Wait. The kiss, I guess, couldn’t. Linda: Awkward but nice, so nice we tried it again the very next date! Kristy: Tell us about the time/occasion you told him you loved him. Linda: I didn’t wanna scare him off, so I waited till he told me. Kristy: Tell us about the proposal. Kristy: Tell us about your wedding. How many bridesmaids? Flowers you and they carried? Colors? Linda: It was a great day. We got married in my church’s picture perfect wedding chapel. I had three bridesmaids who wore pale blue gowns. Each carried a single pink rose. I had a larger pink rose bouquet. When we left the church, instead of getting into Paul’s car, which had been painted with embarrassing slogans, we stole Paul’s brother’s car and drove it to where my car awaited down the street. Kristy: Did you buy, borrow, or make your wedding gown? What was it like? Linda: We bought it. It was a lovely white lace, traditional gown. Linda: We were kind to each other and did not smash cake into each other’s faces. 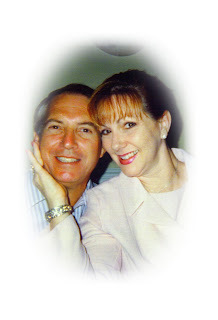 Kristy: Thanks, Linda, for sharing your love story with us. I'm sure my readers enjoyed it! Ahhhh, how romantic! Today is Friday, the 13th. I call Friday, the 13th my blessing day. Why? Because my daughter was born on Friday, the 13th. And she's been a huge blessing to me her entire life. Yes, God smiled on me that day. He blessed me. Tuesday afternoon we drove to Gainesville, Florida, to be with Milton's sister as she took some treatments at Shands Hospital. We spent the night with minister friends, and the six of us, Milton, me, Milton's sister and husband, and our/their friends, had a great time "talking shop" over a delicious home-cooked roast dinner in their beautiful home. As ministers, we lead interesting, varied lives with hearts to reach out and help people. But it's also an isolating life away from our peers, so when we get a chance to be together, we love it. Of course, in our families (mine and Milton's), we have almost 30 ministers and wives (yes, you read that right; no typos), so we have built-in friends to share with. What a privilege. How unique. My other life, is, of course, writing. But my kaleidoscopic life as a minister's wife is a huge boon to my writing life. It lets me get close to people and feel their hurts as I pray for them and lift them up, and so it's given me empathy, what all writers strive for in their writing. For example, last night after church (Wed. prayer and Bible study), a bunch of the church people went to Denny's for fellowship. One woman was burdened by a family situation; it's pretty dire with seemingly no solution. We all offered advice and encouragement. Then I said, "Why don't we pray right now?" So, around a long, long table at Denny's, a large group of people paused in their eating, joined hands, and I led--out loud--in prayer. We didn't care who heard (of course I did it tastefully and not ostentatiously), and you know what? The Lord answered. A peace pervaded the place when we all opened our eyes. Good things are happening in my writing. I am writing a story of grace that takes my breath away and brings tears to my eyes as I write. Whew! Life got so full, I didn't have time to share it on my blog. Hence, a small update. A week in a luxurious time-share in Orlando with daughters and four grands. Glorious! A few days in St. Augustine exploring the sights. I'm a native Floridian and have been there many times, yet we enjoy taking friends. Lunch and antiquing on Amelia Island. Church work, so rewarding. A kids' crusade at church. Other church events. Church services. A missionary and wife coming tomorrow to spend the night with us and minister in our church on Sunday. Upper wisdom teeth surgically removed which necessitated a second emergency surgery and a diagnosis of cellulitis two weeks ago. Scary and painful. My teeth still won't close, hence, soups and jellos, and my mouth still won't open very much. A painful ping pong on my left cheek. Hoping antibiotics will wipe it out. Professionally, working long hours on novels and proposals.